I hope you enjoy the paintings and drawings you will find on my website. I and my spouse, Jill, who is an artist/printmaker, live in the town of Skaneateles, N.Y., southwest of Syracuse, in a beautiful 1838 farm house on four acres landscaped with numerous gardens (Jill is a Master Gardener). Our studios are behind the house in what was originally a hay barn converted for year round use. 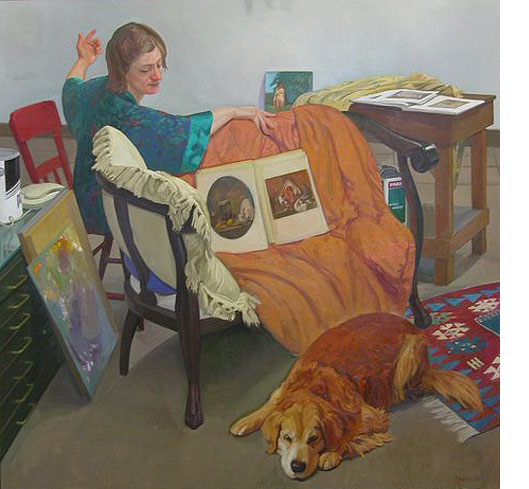 Our two dogs, Plato and Boswell, appear in numerous paintings. I have taught at Syracuse University in the School of Art and Design since graduating from Pratt Institute with an MFA in Painting in 1967. I have loved every minute of it. Choose a link above to see drawings, portraits , figurative, pastels or still life work. Copyright ©2006– Gary B. Trento. All rights reserved. No images on this site may be copied or duplicated without permission from the artist.